Led by Certified Positive Lifestyle & Business Coach Laura Sgroi in this workshop, guests will be inspired to set goals for their life in the year ahead and focus on how to take action to get their 2019 off to a successful start and keep the momentum all year long! Join us for a fun and creative way to make your resolutions and dreams more tangible and attainable while you recycle magazines and upcycle yourself! Join us for cocktails and a V-day inspired Pop-Up show of new works by popular Miami artist, MANO including MADLove a collection of small abstract works, painted on canvas, with a resin finish and so beautifully framed they’ll have your heart racing. Make it a date night, a girls night, share this evening with those you love. See you Thursday! All artwork is for sale and will remain on view through February 14 at The Wardrobe in South Miami. Mark your calendars for the best party of the year, Art + Soul, celebrating the fund for African American Art. Join us for a cocktail reception and seated dinner under the stars with a menu prepared by celebrity Chef Amaris Jones. Includes access to Reveal and Celebration. Enjoy a champagne toast and lively program as we unveil the Ambassadors most recent art acquisition. Includes access to Celebration. The party continues with entertainment by Jillionaire and A.Randolph and The Smash Room Project, cocktails, canapés, and dancing under the stars. Frames USA & Art Gallery presents “Matt Stock: The Wilds of the Everglades.” Opening night is February 22, 2019. Local art and photography lovers will be able to marvel at the unique and vibrant photography of the visionary photographer Matt Stock. Attendees will also enjoy refreshments and light bites sponsored by Carolina Ale House nearby. All of Stock’s photography is on sale and guests will have the opportunity to talk with the artist about his work and vision. The exhibition will run through March 18. Guests who RSVP on Eventbrite get a free gift! Frames USA is hosting monthly events throughout the year. Please visit our website at framesusamiami.com or follow us on social media for more info. In March, join us for activities inspired by botanical creations from 2-4 PM and free admission throughout the day, on the last Sunday of the month. Like artists, The Haas Brothers, explore and create with natural materials. Family Day is a free, monthly IDEAS program created to engage families with children of all ages in activities that encourage conversation, exploration and experimentation through art. In February, join us for activities in multi-sensory art from 2-4 PM and free admission throughout the day, on the last Sunday of the month. Paola Pivi’s exhibition, Art with a view, stimulates our senses. Ignite your imagination using all of your senses through a series of design challenges. Family Day is a free, monthly IDEAS program created to engage families with children of all ages in activities that encourage conversation, exploration and experimentation through art. In April, join us for activities in collaborative collage from 2-4 PM and free admission throughout the day, on the last Sunday of the month. With your friends and family, create a one-of-a-kind collage, inspired by Aaron Curry. Family Day is a free, monthly IDEAS program created to engage families with children of all ages in activities that encourage conversation, exploration and experimentation through art. Housing Works’ invites you to attend its 3rd annual Design on a Dime Miami on February 3-4 at the Moore Building in Miami’s Design District. Design on a Dime Miami is a one-of-a-kind room vignette that will be curated by 25+ top interior designers from donated merchandise that will all be for sale. All proceeds from this event will help fund The Housing Works AIDS-FREE Campaign- a collaborative, multi-year initiative committed to ending the AIDS epidemic—in New York State by 2020, in the United States by 2025, and worldwide by 2030. Watches & Wonders Miami returns from February 15th to 17th, 2019. The event expands from 21 to 28 brands showing their creations at this second edition, which is again led by the Fondation de la Haute Horlogerie in partnership with the Miami Design District. Fine watchmaking, high jewelry, vintage cars and yachts combine for a weekend of luxury immersion into a world of excellence. Immerse yourself in the rich cultural diversity of the Middle East! During this jam-packed day, enjoy instrument demonstrations and performances by Iranian musician Reza Filsoofi and dance along at workshops by MECA Dance Ensemble. Try delicious Persian cuisine and learn about the vibrant folkloric traditions of the Middle East through hands-on craft activities. Jewish communities around the world are led by a Rabbi, and by his wife: the Rebbetzin. These women devote their days to their community, their strength to their service, and their minds to their mission. We all know the Rabbi – his public appearance, his sermons, his prayers – but what about his partner? What passions drive this fierce and feminine force to devote her years to a life of service? What narrative is behind all the wonderwoman-like work that is invested in building and cultivating community? Tonight, we get to glimpse behind the scenes. Tonight, we get to hear her story. Cocktails from 6:30 to 7:30; Doors will close promptly at 7:30pm. interdisciplinary genre in the region. the symposium for children, teens and adults. This event takes place during NSU Art Museum’s Free First Thursday’s Starry Nights. What began as a small function amongst friends has now successfully become a platform for locals in Miami-Dade County. Celebrating another 365 days of culture in the 305, Backroom Sessions closes out 2018 with its 2 year anniversary showcase, “Best Of Backroom”. Featuring the cream of the crop in homegrown talent, the multi-genre concert will be filled with local Visual & Performing Arts activations that highlight the creative communities. These will be complemented by vendors offering a selection of merchandise, food, & drinks that are custom to the culture found down here at the Bottom of the Map. Hosted by local influencer Sean Bang, Best Of Backroom will take place at The X Miami on Saturday December 29th at 6 PM. Come through and show love to the locals putting on for the city. Step into imaginary territory, manipulate algorithms and immerse yourself into a virtual playground at XYZT, an exploratory interactive experience through ten digital light sculptures. XYZT: Abstract Landscapes is a world-travelled exhibition by internationally acclaimed contemporary digital artists and multimedia choreographers Adrien M & Claire B. Whether you are walking on floors that react to footsteps, manipulating light particles within a giant digital cube or blowing into glass boxes and witnessing virtual letters that assemble and disassemble as by a touch of magic, you are in for an immersive sensory encounter. Talking Shots invites you to celebrate the holidays with an open bar, music, video games, good company and great conversations featuring a special guest performance by Miami rapper ToBy. This event is for local artists, content creators and businesses to network and have a good time. Everyone is welcome. Doors open at 7pm. Chris Dyer is a Peruvian-Canadian artist based in Montreal, who exhibits, performs and teaches his art worldwide. Though his styles, mediums and subject matter are in continuous flux, the main theme seen through his artwork is cultural and spiritual oneness of humanity and beyond. He serves as a conduit and builder of bridges between different art movements including visionary paintings, street art murals, skateboard graphics, and more. His subject matter is as varied as his styles, and the resulting art is a reflection of his personal spiritual journey. This is Chris’ first US exhibition in 5 years and he will be showing most of his original art collection, not to be missed! Moksha Arts Collective has produced world-class multimedia events for over 16 years. This organization has presented international art fairs, multi-disciplinary lecture series, and outreach in local communities. We have had the honor to host both locally and internationally renowned artists and scholars. As of 2016, Moksha Arts Collective has been federally recognized as a 501(c)3 public charity. Moksha engages the community with events that spread awareness on key social and environmental issues affecting our world. Proceeds from this event go to support the various community programs of the collective. The Main Event Celebration will feature art displays, interactive exhibits, live painting, live music from two stages, vendors and much more. We will feature live painting by Chris Dyer and a selection of painters. Installation deco by Funktion Forms and more T.B.A. Admission: Presale tickets will be available up to the day before the event for $35 and $45 at the door – available online at eventbrite. ~ITAWE CORREA (LOCOS POR JUANA) voc. ~ANDRES PONCE (ELASTIC BOND) keys. ~LOURDES SOPHIA ROMERO (ELASTIC BOND) voc. ~JOSE ELIAS (SPAM ALLSTARS/ NAG CHAMPAYONS) guit. ~FABIO PATINO (NATIVOS JAMMIN ORCHESTRA) drums/vox. ~KENNETH METZKER (NAG CHAMPAYONS) perc. ~RYAN CACOLICI (NAG CHAMPAYONS) keys. ~CITO THE ALCHEMIST~ (TELEKINETIC WALRUS) sax. ~CORINNE STEVIE~ (TELEKINETIC WALRUS) voc. ~IVAN PALMA (BIG BROOKLYN RED) drums. ~MARCEL SALAS (BIG BROOKLYN RED) bass. ~SEAN EDELSON (JAMIAM/ RAMBLING STRING BAND) guit. ~SEAN DIBBLE (RHYTHM FLOW) perc. Welcome to Hyper Speed, an Art Basel Experience @ X Miami. We’re excited to be collaborating with New York stars, A$AP Ant, A$AP ILLZ, & Chey Anderson on 12.07.18. This artistic vision is curated by Rareform Creative Group & Creative Glue. This evening is filled with technicolor, multicultural parades of DJ’s, music artists, fashion designers, hype beasts, & the star-obsessed. Gearing up where design, hip hop, & dance music will deliver the coolest style & connectivity that is sure to make noise in the 305, all thanks to our main sponsors Revolution Radio & PerChance App. Welcome to the La pARTy, an Art Basel Experience @ X Miami. We’ve assembled an amazing team along with Revolution Radio, Creative Glue & DeepTalk, to create the first ever all women-based event during Art Basel. There’s no better way to close out the “year of the woman” with an epic celebration of women diversity, entrepreneurship, innovation & creativity. 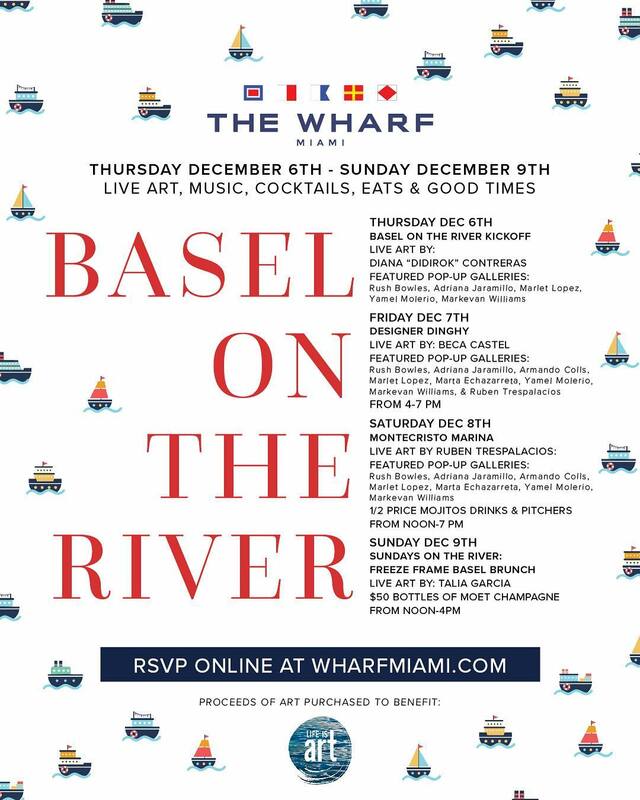 La pARTy offers a unique opportunity for guest to connect with Miami’s top female companies, artist & leaders during Art Basel. Art Basel gets a South American touch on Friday, December 7 from 7-10pm with the Cavallaria Exhibition as famed celebrity and fashion photographer Marcos Mello conducts a live photoshoot of Brazilian supermodel Isabeli Fontana at W South Beach’s WET, while Victoria’s Secret Angel Barbara Fiahlo gives her first exclusive live performance of 3 original songs, 2 days ahead of her music career debut. Renowned environmental artist Xavier Cortada will host a kickoff Art Basel event for “Antarctic Ice Paintings: Global Coastlines and Underwater HOA,” a series of 60 untitled, never-shown-before paintings that the Pinecrest Gardens’ artist-in-residence created while in Antarctica, using the very glacier ice that threatens to drown Miami. As part of the exhibit, Cortada will invite General Consuls to name the works after other global coastal communities impacted by sea-level rise. The exhibition serves as the launch of the Underwater HOA participatory public art project, which aims to engage citizens across Miami-Dade County in addressing rising sea levels. The event will be held in the Hibiscus Gallery at Pinecrest Gardens (11000 Red Road, Pinecrest, FL 33156) from 6:30 – 10:00 p.m. on Thursday, November 29. There is no cost to participate. 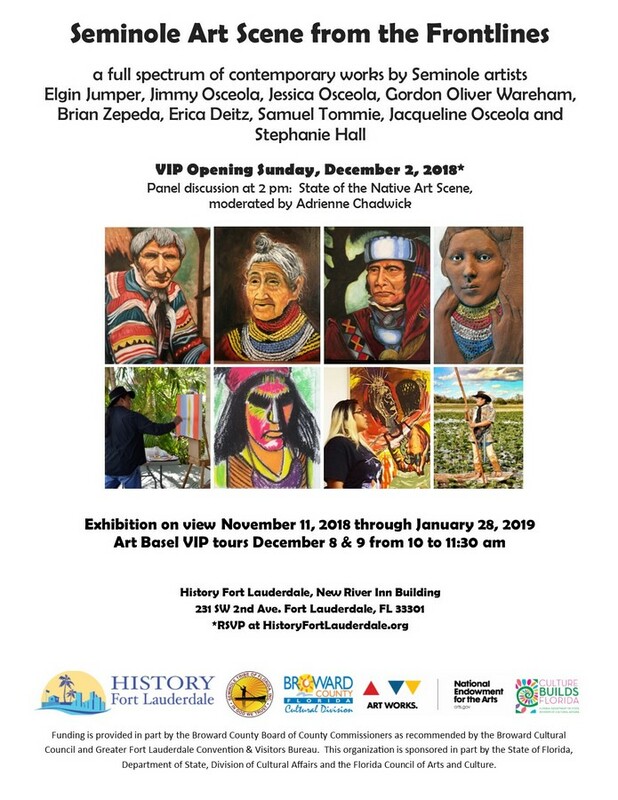 The exhibit is open until January, 13, 2019. For more information, call 305-669-6990 or visit www.underwaterhoa.org.